Shorts SC-5 Belfast G-BEPS (c/n SH.1822) at Schiphol in 1997. Shorts SC-5 Belfast G-HLFT (SH.1819) seen at the cargo ramp of Schiphol, March 1994. During the 1990s the Belfasts were frequent visitors to Schiphol, bringing parts for Fokker Aircraft Industries and operating cargo flights on behalf of KLM. Only 10 of these magnificent aircraft were built by Short. It was manufactured as a strategic longhaul transporter for the RAF. Defense cutbacks were initiated in the 1970s and it meant the axe for this promising freighter, for the production time proved to be too short to develop interest abroad. It was built in Belfast, Northern Ireland and entered service with the RAF Transport Command in 1966, after the prototype first flew on January 5th 1964. 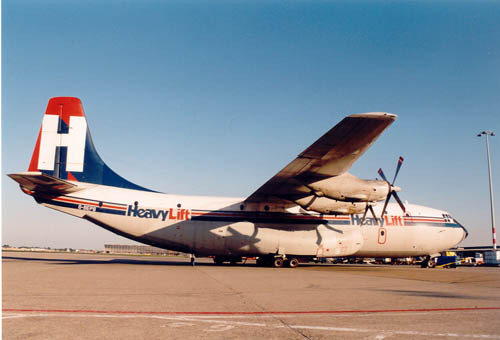 Heavylift Cargo Airlines was started in 1978 at London-Stansted with initially 5 Belfast C.Mk 1 aircraft and later another 2 were purchased for use of spare parts supply. The other aircraft were sold to Pan African Freightliners, though what became of these I do not know and would welcome information on this. The Belfast had 4 Rolls Royce Tyne Mk 101 propellerturbines which gave it a max. speed of 560 km/h; its range was a disappointing 1600 kms, much less than the Lockheed C-130 Hercules (2470 kms) and Antonov An-12 (3600 km). This was caused by reaching back during the design to the Bristol Britannia (e.g. the tailsection) and not designing the Belfast as a complete new aircraft. The RAF solved the short range by enabling inflight refuelling for this aircraft. When Heavylift bought these aircraft, this was removed. The payload was 35 tons but the cavernous hold (4.90 m wide and 27.43 m long) could take outsize cargo which would not fit in a Boeing 747; the heavy Chieftain tank could be transported, which the Lockheed C-130 could not. Heavylift used the excellent transport capabilities for charters all over the world. 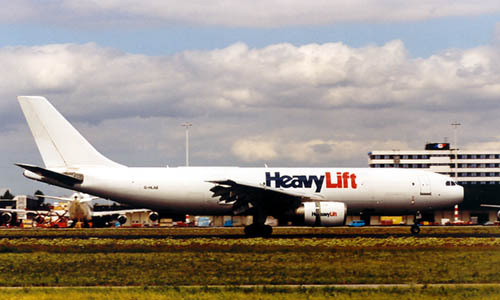 While Heavylift used only 2 Belfasts during the 1990s, by the time of the demise of Heavylift Cargo Airlines, only G-HLFT was operational and G-BEPS was stored at Southend. By August 2002 the Airbus A300 operation had been scaled down: G-HLAB had been parked at Bristol-Filton and G-HLAC had been leased or sold to Aero Union in Mexico as XA-TVU. Airbus freighter G-HLAB is seen here at Amsterdam Int'l in May 1999. 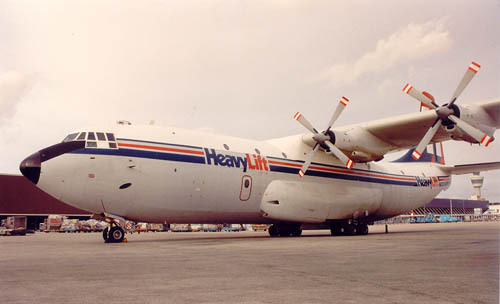 Heavylift was also involved in a consortium with Air Foyle (Air Foyle Heavylift) which operated the large Antonov An-124s as well as An-12, An-22, and An-224 on a charter basis for cargo flights. Recently (2001) HC Airlines had also started up passenger operations with an Airbus A300 (G-HLAD cn131) under the name of Prime Airlines; however this proved to be short-lived as by September G-HLAD was reportedly stored at Shannon, Ireland. The fleet of HeavyLift (though not all at the same time): Antonov An-124-100, Airbus A300B4-200, Boeing 707, Ilyushin Il-76TD, Shorts SC.5 Belfast, Antonov An-12, Lockheed C-130 Hercules.